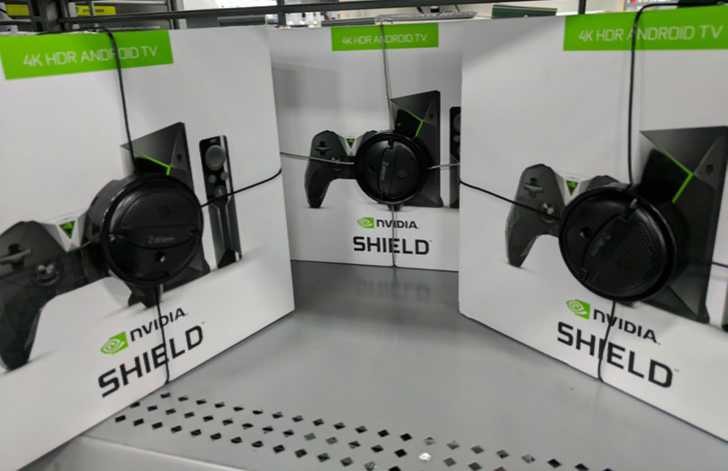 NVIDIA’s new Shield TV is now available at some Best Buy stores. However, officially the device has not been released yet. Additionally, the Best Buy online listings for the Shield TV and Shield TV Pro only allow you to pre-order. Smart Enabled: Get access to a world of instant entertainment with this product. Just connect to the Internet and stream movies, listen to music, and access a wide variety of other content. A huge selection of entertainment: Stream movies, music and other content using a wide range of apps, including Netflix, Amazon Video, YouTube, HULU, HBO, ESPN, VUDU, Showtime, Pandora, Spotify, Sling TV, PlayStation Vue, Plex, and Kodi. A killer view: Movies, TV shows and games look unbelievably good with best-in-class 4K HDR or high-definition 1080p. Chromecast 4K Ultra built-in: Share your valuable photos, fantasy football lineup, or that thing you just have to show your friends to the big screen from your Android or iOS phone. Voice control: Control your entertainment, search results from over 100 apps, including Netflix, YouTube, HULU, HBO, and more. Just say what you want to see and let Google’s voice search find it within seconds. 500GB storage memory: Enough memory for system files and a small amount of additional storage. SHIELD has a microSD card slot for expandable storage up to the 128 GB limit of today’s microSD cards and supports external USB hard drives. USB 3.0 and USB 2.0 ports: Quick plug-and-play connectivity for your devices and accessories. Bluetooth 4.1 interface syncs with compatible devices: Wirelessly transfers photos, music and other media between the laptop and your Bluetooth-enabled cell phone or MP3 player, or connect Bluetooth wireless accessories. Supported audio formats: Dolby Atmos and DTS-X surround sound pass-through over HDMI High-resolution audio playback up to 24-bit/192 kHz over HDMI and USB High-resolution audio up-sample to 24-bit/192 kHz over USB. Audio support: Including AAC, AAC+, eAAC+, MP3, WAVE, AMR, OGG Vorbis, FLAC, PCM, WMA, WMA-Pro, WMA-Lossless, DD+/DTS (pass-through), Dolby Atmos and Dolby TrueHD (pass-through), DTS-X and DTS-HD (pass-through). Compatible with most TVs: Easily connects to HDTVs.